Home » About Us » Directions/Contact Us » Need Directions? Detailed instructions for arriving at our headquarters and lab in Evry, France by train or car. Paris Orly is the nearest airport – 15km – 20 minutes by car. 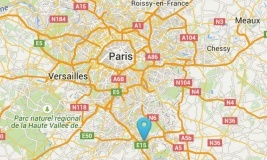 Paris Roissy-Charles de Gaulle (CDG) – The airport is about 70 km, and around 1:20 by car. From Paris, take the RER line D towards Corbeil Essonnes via Evry-Courcouronnes, exit at Bras de Fer Genopole Station. Take exit near the end of the train. At the top of the escalator in the lobby take the exit Place du 19 mars 1962 and follow the sign Pedestrian AFM – Genethon – Génocentre. Cross the square and take the pedestrian tunnel (Passage of the Dardanelles) under the N7. Behind the AFM take the pedestrian crossing left (Allée du Père Duchêne). Turn left and walk along the rue de l’Internationale roundabout. Turn right and walk along the fence for 50 meters. Pass the gate and enter the site. IntegraGen is located in the inner courtyard, behind the security stop. Take A6 from Paris towards Lyon. Exit N104 (Francilienne): A5 – Corbeil Essonnes – Melun Senart. On the N104, exit N7: Corbeil Essonnes – Evry Village. At the 1st roundabout, turn left into the direction Evry – Paris. At the 2nd roundabout, turn left: Genopole Campus 1 (Site Henri. Desbruères – AFM). At the 3rd roundabout, turn left: Genopole Siège. IntegraGen is after the security post. If taking taxi: Print these directions for your taxi driver.